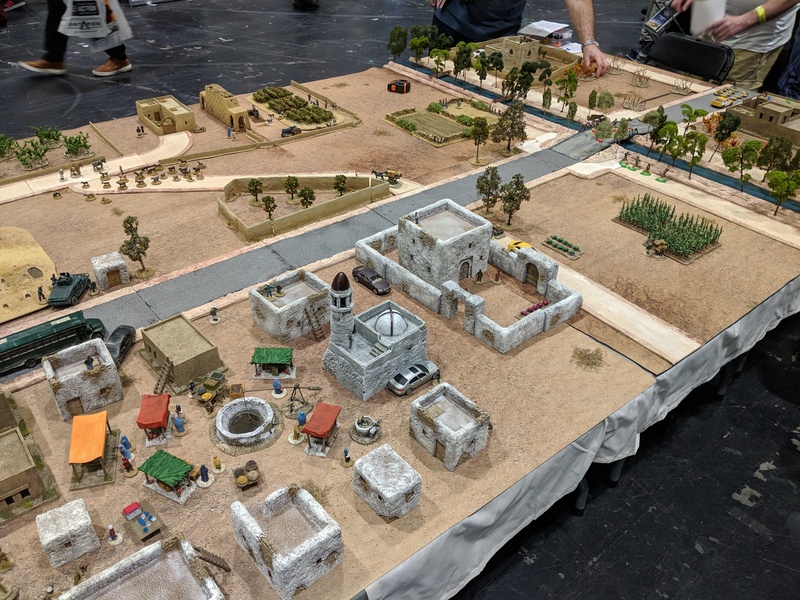 Salute is the largest wargames show in the UK and, for me, a chance to visit London, see the sights, catch up with other wargamers and then escape within 24(ish) hours with a bag full of lead and future plans made. Since going to my first in 2015 as I rejoined the hobby, I’ve eagerly enjoyed going along even when I moved up north and turned 1 hour on the train up to 4+ depending on the time of day. Salute 2018 was even better as I was joined by my demo game assistant Peeb’s Gaming Nonsense who came down to see the delights, share the cost of the hotel and work together to prevent us spending way too much while at the show. With my trip to London being kind of part of my Summer holiday (at least in the budget), I usually try to get out to some local attractions and be a tourist. Thanks to taking the morning train rather than the afternoon, I was able to do my touristy stuff on the Friday rather than the following day when my bag is filled with models. With a few hours before I was going to check in to the hotel, I headed off to Chelsea to visit The National Army Museum. The Museum is definitely very modern, with lots of interactive displays and graphics alongside display of artefacts. I’d actually done the museum last year so apart from a quick run round, my main focus was up in the temporary gallery area with their Special Forces exhibit. The exhibit has an entry fee (unlike the rest of the museum) which was maybe a little on the pricey side but the exhibit was well done. If you’ve read a lot of Osprey books you’ll find most of the information familiar, although I felt it was presented well. As well as plenty of information boards covering all aspects of the Special Forces, there was lots of kit on display, ranging from WW2 up to the present day. The rest of the museum was still the same high quality, with multiple displays covering the entire history of the army and tons of artefacts. Having already been here, this was more of a cursory look round and soon I was heading back to the underground. After heading off to check into the hotel, the rest of the evening was spent in the [email protected] until it was kicking out time. Waking up in no great rush, we grabbed breakfast at the hotel and leisurely walked over to the Excel (one of the advantages of staying close by) for about 10:15. Despite being so close to opening time, we managed to just walk straight in with only the shell of a queue to join. I think the organisation team seemed to have nailed the process for getting everyone in at a sensible speed. First role of the day was to go round and do the Ultramoderns check – see what new things/previews were on offer for my chosen era of choice. Kicking off with Spectre Miniatures and they had their new releases (along with what seemed like their entire range) being shown off in the usual display cases and available from the racks behind them. Nothing new in terms of previews. Every time I went past the stall throughout the day, Spectre always seemed to busy. I did also visit Empress, despite already having the latest releases on my painting tray. They didn’t have anything new and, although tempted by a T14, I ended up saving my money. I’ll be getting one of those when my Russians get to the tabletop. Another company whose releases are in the queue is White Dragon Miniatures. I caught up with them at Chillcon and got to have a pretty long chat about whats coming next. These guys are the foot patrol versions of the currently released Vehicle Dismounts, wearing patrol packs and some slight tweaks. More exciting is what was on the shelf above – as well as the quads, Foxhound and NVGs, Salute saw the first showing of the Taliban figures. These guys look rather nice and I can’t wait to see the rest of the range. White Dragon have shown off these guys in some images in the Modern Miniatures group if you want to see some nicer pictures. Not necessarily interesting for me but I known a few people play Ultramoderns in 20mm. Well, White Dragon showed off some 1/72nd scale Brits. This is one of the great things about CAD designed models – it’s really easy to rescale or make minor adjustments. Blotz were also showing off their range. As much as I’m excited about some of these buildings (that compound especially), some of the doors and staircases seem a little small for 28mm when I was there but I think I’m gonna pick some up in a few months once I finish off the pile I already have. The minaret especially would be a rather distinctive. After looking around for things to buy, I instead set off to take a look and take all the photos of things that caught my eye. Most of these are not suitable for my prefered era of wargaming but it’s still great to see the best of the hobby all on display. TT Combat had a massive stand which was dominated by several bundle tables offering tons of their MDF. It does show off just how much stuff they produce. I may have had to drag Peeb away from the sci-fi desert planet buildings in the top left. They did however also manage to fit in a few demo tables for their range of games including this rather nice setup for Carnevale. Their buildings could be quite good for building a modern Venice, perfect for some spy related shenanigans. This wintery game of Bolt Action was packed full of details. Quite cool to bring a background element as well. Spotted this very early in the day and didn’t see a huge amount movement on it by the time I left. However, it was a great looking WW3 game, complete with lots of helicopters and carefully hidden NATO troops waiting to spring the ambush on the thousands (or so it seemed) of Russian tanks and BMPs pushing through the area. Something that stood out all day was the blue tent at the very end of the convention hall. Upon reaching it, I was treated to this rather impressive sight of two games using custom lighting and effects. This Necromunda game worked especially well. Looking at more sci-fi was this rather neat looking compound. This setup actually stopped me in my tracks. The multi-storey hab block looks like something ripped out of every cyberpunk story. I’m almost tempted to get some and start doing some near future, megacity street fighting. It’s also cool to see the detailing pack, letting you theme the boxy base buildings to whatever type of sci-fi environment is most appropriate. A rather nice battle going down in Florida as the Spanish raid a plantation. The board included some tall ships sat in the creek while the main force formed up for battle. The first of two Battlegroup games, this one covering The Battle of Leros. I listened to the team behind it talk about the historical battle on A Few Brits and the Hobby and it sounded like something special – FJ, Brandenburgers and Luftwaffe troops fighting against the LRDG, British and Italians on one of the Greek Islands. The board itself is something else, with floatplanes and a mix of forces battling over a Mediterranean landscape. The other Battlegroup game saw US and German tanks clashing in the desert in Tunisia. Aside from the nice buildings, I also really like the base material. It’s sackcloth with bits of sand and shrubbery piled on but it works well and saves on carrying big chunky boards everywhere. I always find 40mm to be a mad scale to wargame in so seeing board with a fort (constructed by TM Terrain) AND big blocks of troops was something rather special. Finally, this was something that I was really excited about. I have a soft spot for Mechwarrior, especially the Mad Cat/Timber Wolf, so seeing a 28mm version was fantastic. I have something to admit – I find it really difficult to spend more than 2/3 hours at a wargame show, even one as big as Salute. I’m not a major fan of playing participation games at shows (I’d rather be running it) and with my main interests being WW2 and later, most of the stuff on show is just a quick glance and moving. After a few hours of looking around and taking photos, we decided to bounce and go check out a few other things in London. After leaving the Excel Centre I stopped at Meat and Liquor for lunch, visited an Airsoft shop to take a look at more expensive things and then rushed back to catch my train and head home to Edinburgh…. and then spend the following day assembling all my goodies. So how did I like Salute 2018? Well it was pretty great! Not being on the London Marathon weekend meant the Excel wasn’t as packed as it usually is. Several people made comments about the lighting and, although it was reasonably dim, I didn’t find it too bad. A nice variety of stalls and games means there was something for everyone. I think Salute is without equal in the UK for sheer variety and, although you don’t get quite as much time to chat with the sellers about what’s coming next, it’s definitely worth going along to see everything the hobby has to show off. Am I going back next year? Hell yeah.